500lbs of Candy & The CAW CLub!!! In the beginning of November, we had a campaign to collect unwanted Halloween candy and send it over to the troops. Well, we had no idea how much candy we would receive, especially from Betty Herbert and her hard-working kids in the Cherokee High Schools Animal Welfare Club. They got the word out and good! Within two weeks, Betty had collected two SUV’s full. She was not kidding when she said the Club had collected a lot of candy! We want to thank Betty and her wonderful, animal-loving students for not only helping Project: Troop Dogs, but all the animal organizations that they assist all year-long. Because of their efforts, the Troops will have a sweet taste from home for many months to come. THANK YOU BETTY and THE CHEROKEE ANIMAL WELFARE CLUB! Request for MWD Lab, Taylor. My name is SGT. 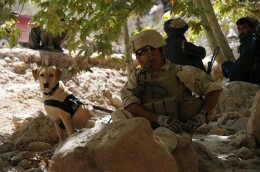 Tom H. im a K-9 handler in the US Army, My MWD (SSD TAYLOR) and I are currently deployed in Afghanistan. First let me start by saying how great it is to see that there is a place out there that is there for Military working dogs and I would like to thank you for everything you guys do for us K-9 teams. It is greatly appreciated. I came across your website and I would love to receive a care package for my MWD. You can manage to get things for yourself here but it’s very difficult to get things for the dogs. Once again i would like to thank all of you for what you are doing. I would like to send you guys a picture of Taylor and I so it can be posted on your website. You are currently browsing the TroopDogs blog archives for November, 2010.